The beauty of scraps! I always get a little 'twinge' when I end up with a pile of scraps from a previous project. Call me strange, but it's fun for me to reconfigure, twist and turn and come up with a quilt. This is my funky creation from scraps I had left over when I made a whole slew of placemats. 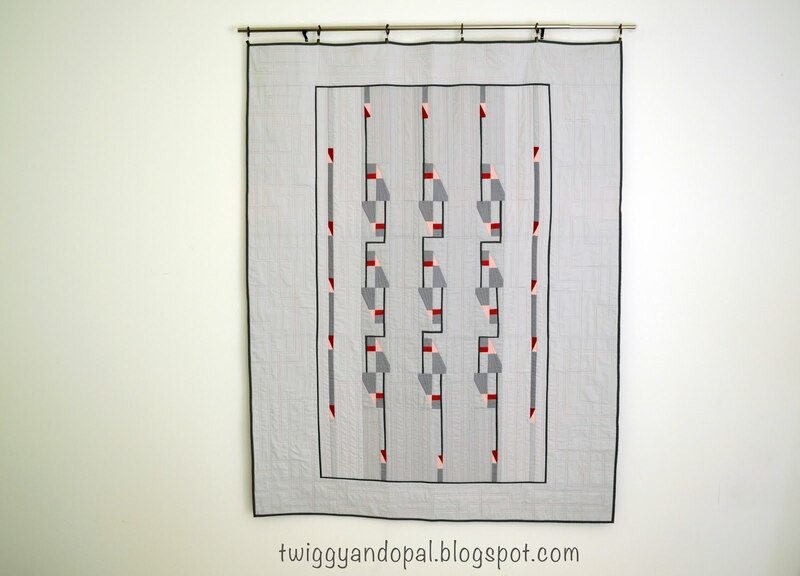 Check out Geometric Placemats to see the original source and From Trash To Treasure! The Process how I took the scraps and pieced the quilt. 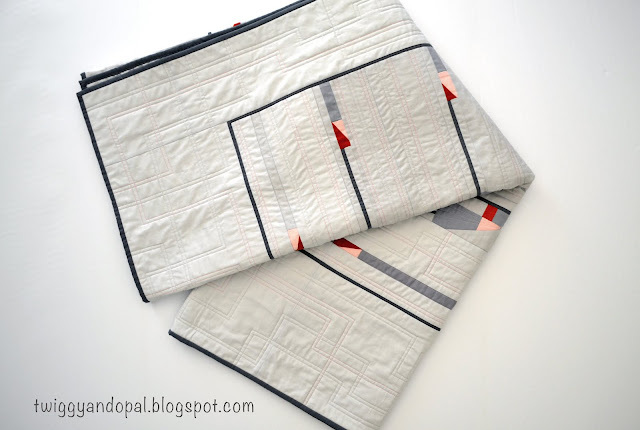 It still takes me a while to come up with a quilting idea, and when the idea finally came to me I jumped in! Which also led to...there's no going back! Once I started I couldn't change my mind and flip the script. Regardless if it was easy or hard, it was happening! 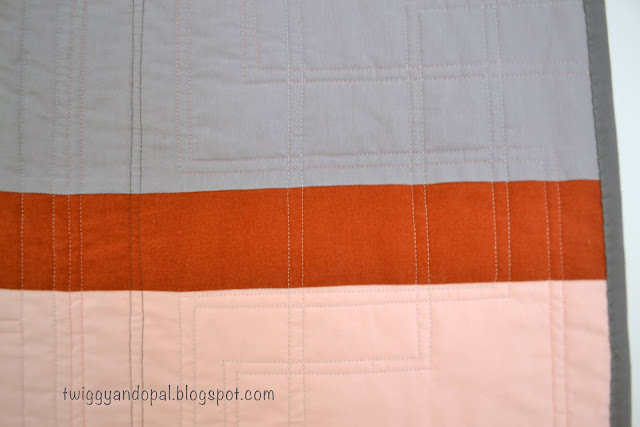 To be honest, I think I picked my thread colors before I knew what my quilting plan was! I first used Aurifil Dark Pewter (#2630) and quilted in the ditch around most of the dark lines in the quilt. Aurifil Aluminum (#2615) and Bright Pink (#2425) was used for the rest of the quilting. 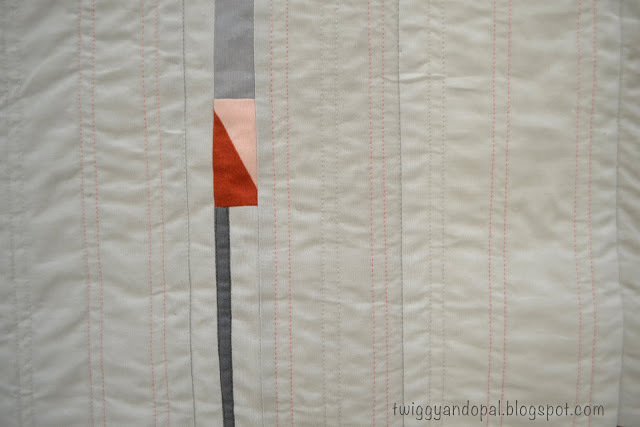 I set about mimicking the vertical design with 1/4" spaced lines in the center portion of the quilt alternating with ping and grey thread. 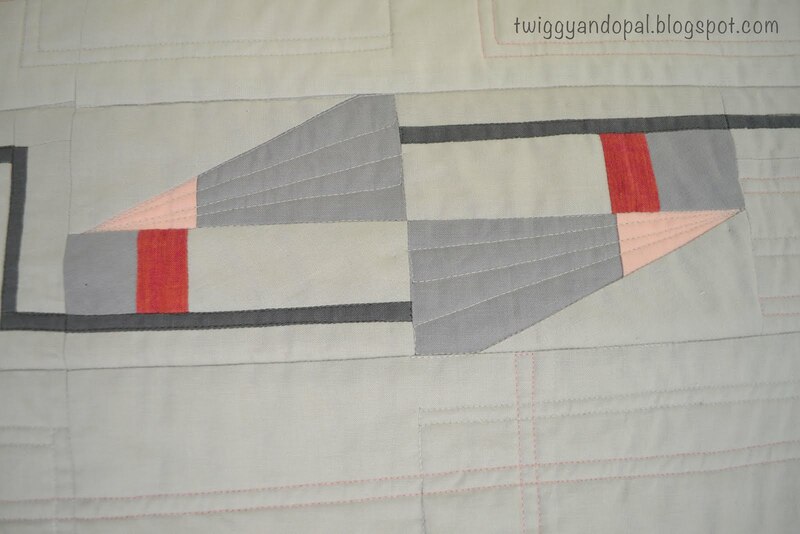 The triangles were the only place where I quilted a different pattern than the rest of the quilt. The real fun began when I was able to start quilting in the border! At first I thought it was going to be a nightmare, but soon found out that wouldn't be the case. I was able to wiggle and maneuver the quilt around pretty easily to accomplish the maze effect I was after. In order to get just the right lines around the border, I would do a series of 1/4" lines using a ruler and my hera marker. Once I had completed a round, I marked another series and repeated the process until the end and I was satisfied. The back isn't quite as intriguing as the front, but you can get a sense of design a little better. It does fit in with the front as far as colors are concerned! Ignore the uneven lines please! I'm quite sure after I wash it it won't matter one bit! Usually I wash all my quilts before sharing the finish. This time I just didn't have the time. Which leads me to ask, do you usually wash your quilts before sharing? I wonder about that! Also, if you are putting a quilt in a quilt show, is it common practice to wash quilts first or not? Curious George here! 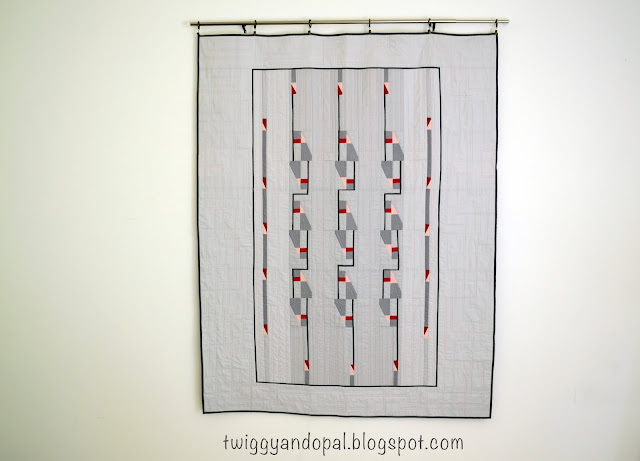 I am not sure exactly why, but I decided to name this quilt 'Finely Tuned'. For some reason all I could envision was an instrument being tuned. The neck of a guitar, the scroll or tuning pegs of a violin and even the strings inside of a piano. Actually, my Mom came up with the name and it grew from there! All the more reason to keep it as 'Finely Tuned'! What I like about these 'improv' or 'scrap' designs is hearing what others see or feel from looking at it. Beauty is in the eye of the beholder, art is objective and that's just the way I like it!! If my last few posts have seemed scattered or not my usual style, it's because I have been in Oregon for the past couple weeks. As of today, I'll be heading back home to Tennessee. It's time to get back to 'things', get back on track and readjust. So, thank you for sticking with me! I am so, so thankful for all the support I have received from everyone. Yes, it's true...Our quilting community is like no other! Very cool Jayne - you are so creative! I love the quilting and how you created echoing quarter inch lines in the negative space, Jayne. Hera markers are such great tools! For show quilts, I will block a quilt if it needs squaring help, which means I wash, stretch, and dry the quilt before binding. Otherwise I trim square and bind and leave it unwashed. Not everyone works that way, but I think it's how the majority of show quilts are handled (blocked if washed). I have never washed a quilt. I do vacuum the ones on my bed weekly. Really, why wash??? I do presoak my cotton battings, though. I couldn’t live without my Hera!! Thank you for the blocking information. I’m thinking about entering a few in shows, but I’ve never been clear on the proper way of care before hand! What a cool quilt! 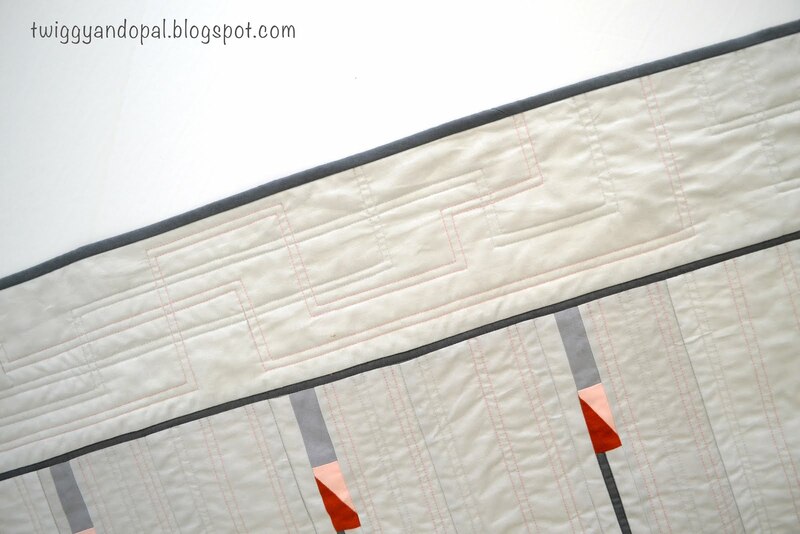 I love the design element of it, and the quilting accentuates it so well. Truly a winner! What a lovely, inspired piece! Wonderful quilting! I don't usually wash a quilt before showing unless it really needs it. Most of the photos on my blog are before washing. I do wash baby quilts before I gift them tho. And confession: I have never blocked a quilt! oops. 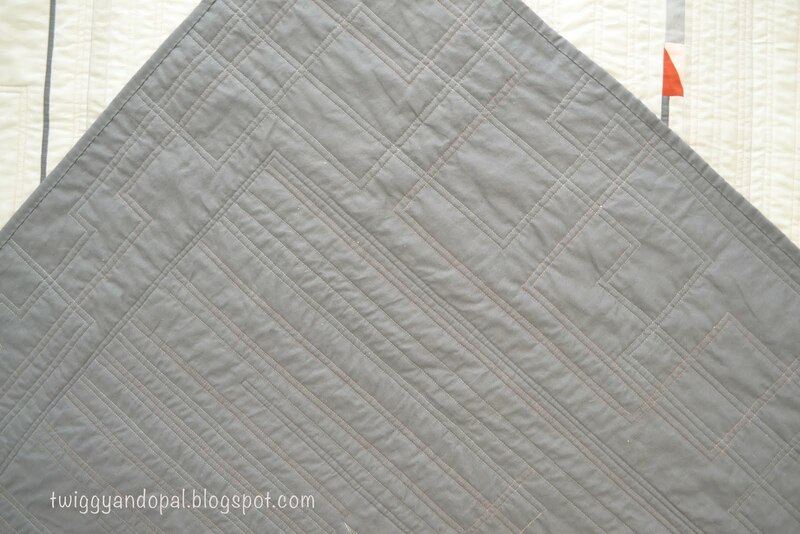 The quilting enhances the design perfectly. There's something Frank Lloyd Wright-ish about this quilt, and I love it. Beautiful! I was dreading quilting this once I had the idea! However, much to my delight…it wasn’t as difficult as I thought it would be! 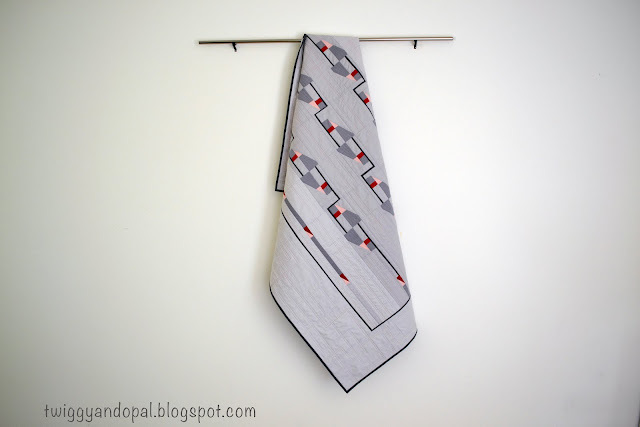 Nice pattern on this - you made good of the scraps! 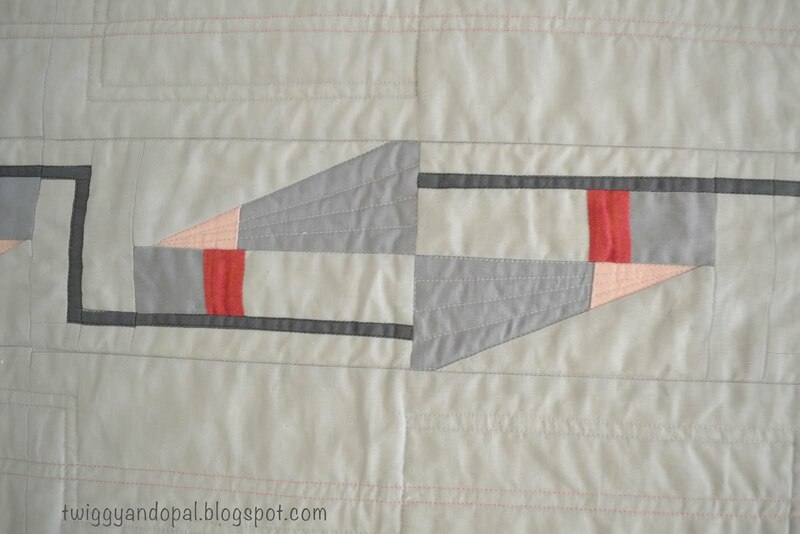 And the geometric quilting is just right. I really love this quilt. It does look quite different now that it's quilted, but I even liked it before! You must have been inspired by being in Oregon! I love your quilting design, especially the maze in the border ! Beautiful finish Jayne ! Your quilt is just amazing. I love, love, love it. The patchwork is intriguing and I like all things geometric. But the quilting just makes it so much better. It compliments the design so well. Oh yes I am liking that border, just a teeny, oh ok a whole LOT! I love the minimalistic look of this one and the inner 'binding' is a great idea. A lovely finish, Jayne!! I really love the intricate tiny piecing, colors, and quilting design! 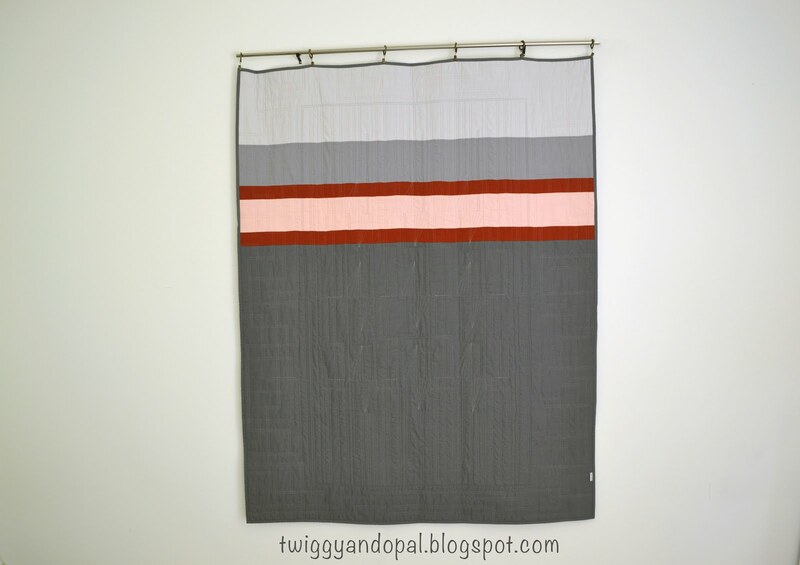 I've really enjoyed following how you made this quilt, Jayne! It's so fun to see how your creative mind works. One thing I haven't tried is using more than one color of thread for quilting, but after seeing what you did here, I definitely want to! Your creative pool is bottomless! 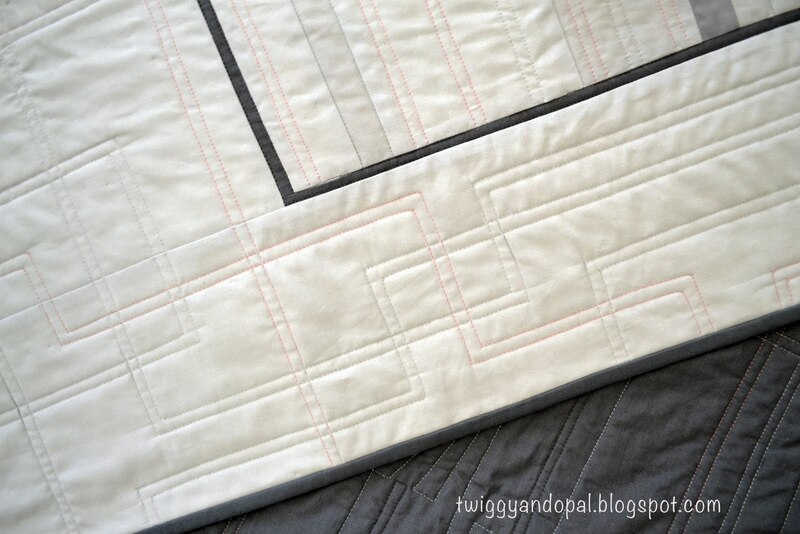 Another great job adding quilting that accentuates your beautiful designs. Thanks for sharing with Oh Scrap!